Has your chicken math exceeded your run space? 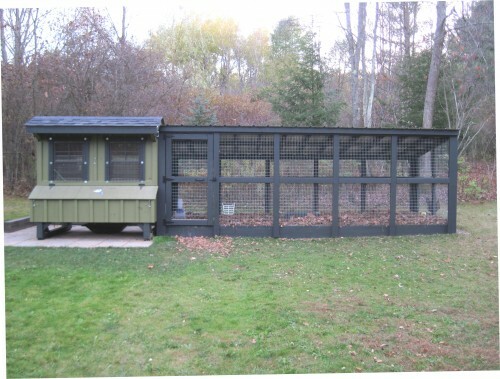 Have you decided to add a run to an existing coop for added predator protection? Whatever point you are at in your flock care you will eventually hit the point where you need to add some protected space for your birds. To inspire some ideas about designing your own custom chicken run, our customers the Crawchicks have graciously allowed us to share a wonderful example of a run they recently completed. After you’ve seen their beautiful work, I’ll share 5 tips for designing a custom chicken run for your flock. 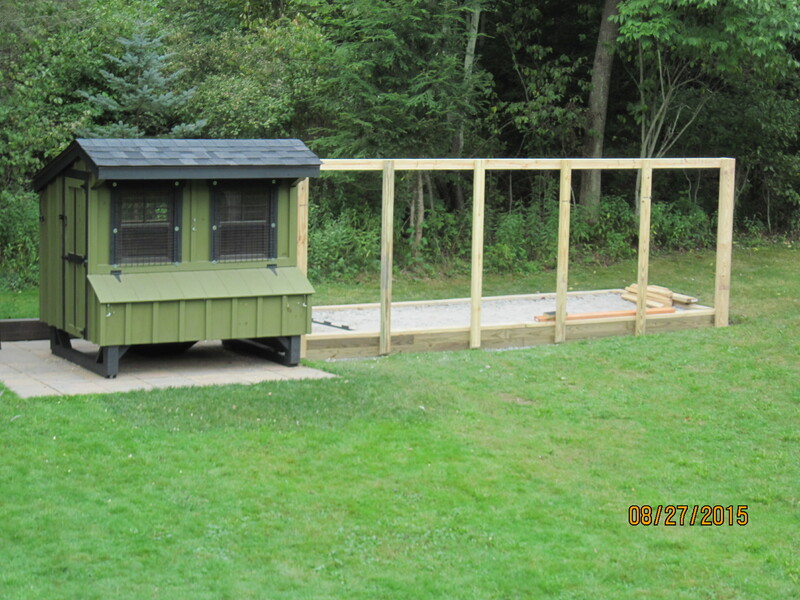 The Crawchicks’ beautiful coop needed an equally beautiful–and secure–run, so they began the task of adding one. 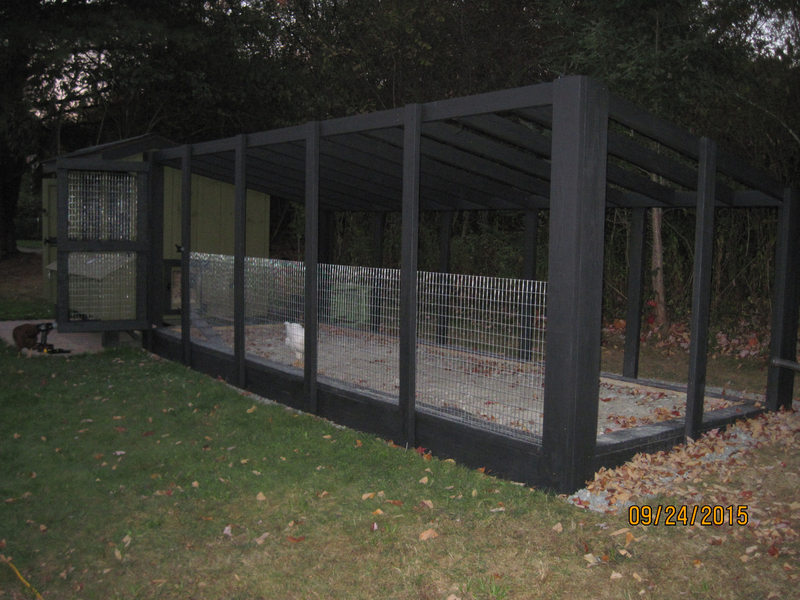 The following pictures show how they designed their custom chicken run to take into account drainage, easy cleaning, functionality, and beauty. 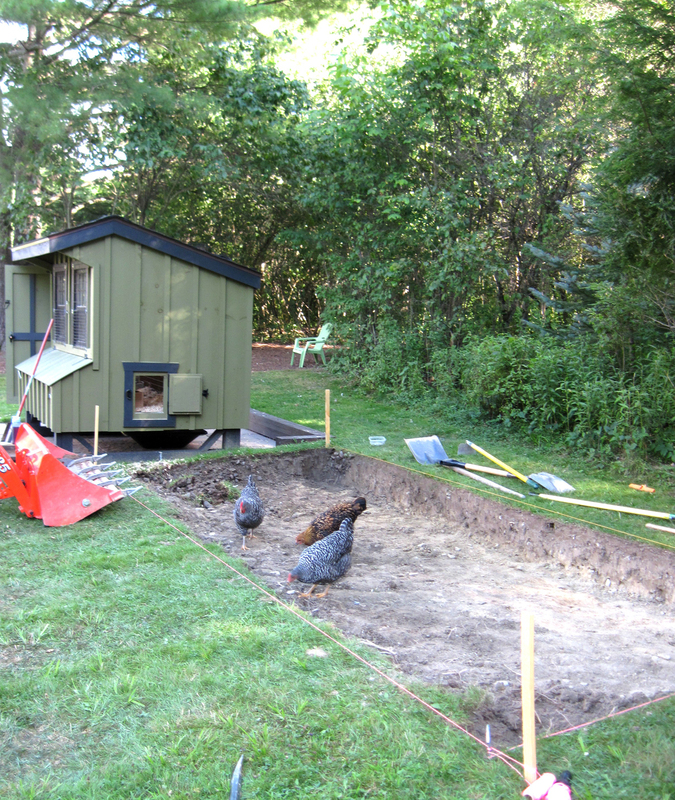 First, they had to have space and a plan (as well as the Helping Hens Group seen assisting with the excavation). Why excavate? 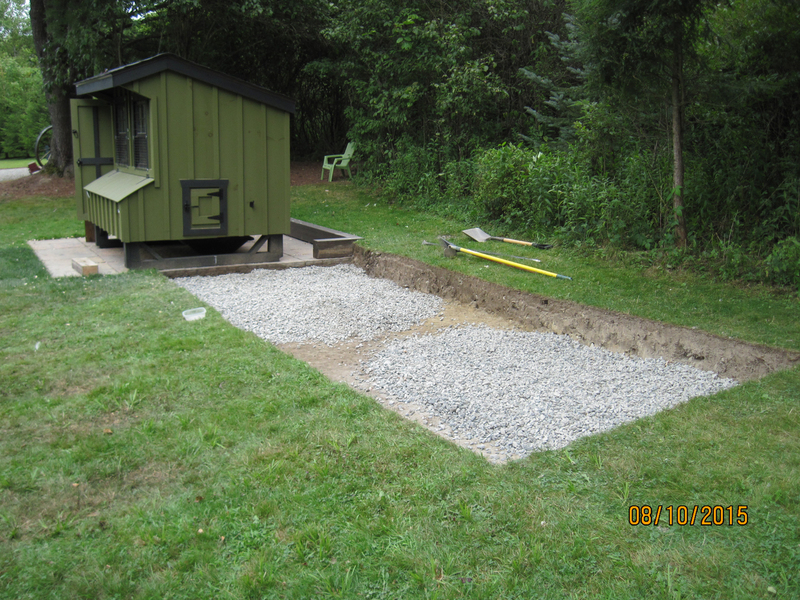 The excavated space is to allow for a deep bed of gravel to be laid down to provide proper drainage so the run framework will not rot. 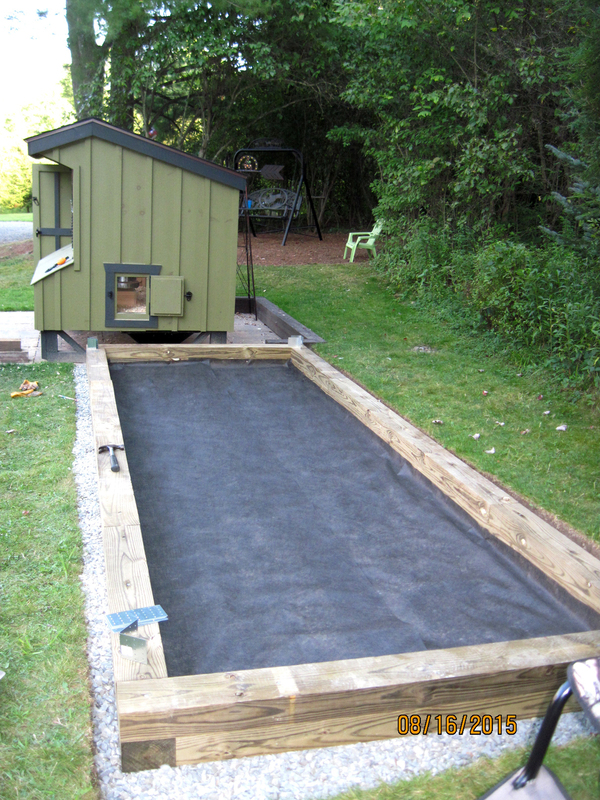 You can do the same thing with a concrete footer, but I love this full pad! After filling the excavated space with gravel they built a base for their custom chicken run, making sure it was square so the framework would all meet correctly. I love how the Crawchicks used treated 4×4 posts to create the framework to help prevent rot. You will see later that for the safety of the birds, they added an untreated sill plate, since treated wood can make your birds sick if they peck at it. After building the framework they laid out permeable landscape cloth and attached it to the wooden frame. This keeps litter from getting too far into the rock bed, and allows for periodic clean-out of what’s on top. With this feature, you can replace the upper layer and still have a sturdy base of rock below, maintaining drainage. Framing and landscape cloth for the Crawchicks’ custom chicken run. On top of the landscape cloth, the Crawchicks then filled in the base with MORE crushed gravel. This provides additional drainage and lifts the birds above the surrounding surface. It’s especially important if you have a coop in a low part of your yard. Chickens don’t do so well if they’re wet… and they’ll object mightily to flooding runs! Once you have a sturdy base you can add walls. Make sure that you have enough posts to support the weight of the roof of your choice! The first wall of the custom chicken run goes up. In the photo below, you can see the full framework. I love this picture, it shows the roof beams as well as the posts and access door near the coop. The hardware cloth is being placed on the inside of the framework, rather than the outside, to allow for a clean, finished look that is secure for the flock. When installing hardware cloth in areas with heavy predator loads it’s a good idea to sandwich it between wood to prevent it from getting pushed in or out. In areas with lighter predators such as cats, small dogs, raccoons and other small critters you usually don’t have to bother with sandwiching. Either way, be sure to remember to seal your wood before you put the wire up! There are many options for roofing. Metal is probably the easiest, just make sure you install rafters between your beams like you see here. The photo below shows some other thoughtful details, such as the corner brace at the back wall. It also shows how they did choose to sandwich the hardware cloth between wood. Another little note: look closely at the latch for the door. See that string that goes to the inside? That is so when the door shuts with you inside you can open said latch. Trust me, you want that option! I have to tell you, I have enjoyed all the details this family put into their design. 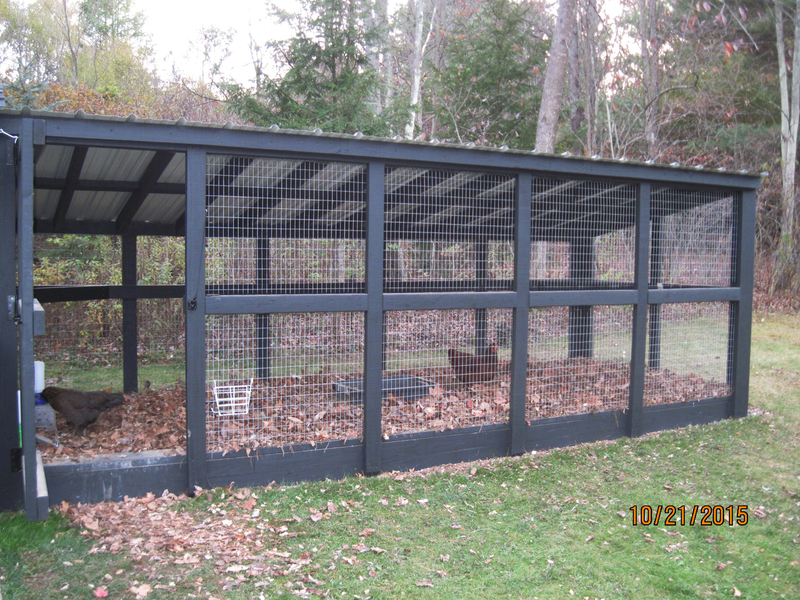 Not only is their custom chicken run strong, but it’s functional and beautiful as well. Look at the toys they’ve added to keep boredom away when the girls have to be locked up. They have the Chicken Treat Balls, the Boredom Busting Ball, and even a feeder for treats! 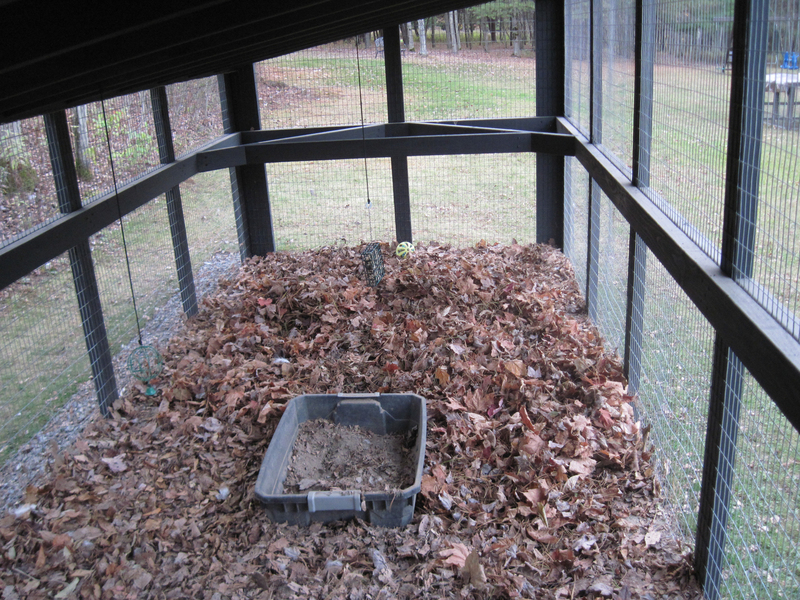 In addition to the toys, the hens have a dust bath pan and leaf litter to search through. Chickens are quite intelligent and curious. Keeping them engaged in their natural, instinctive behaviors like dust bathing and foraging will help them avoid future problems in the coop. Look how happy those girls are roosting on that strong bar! 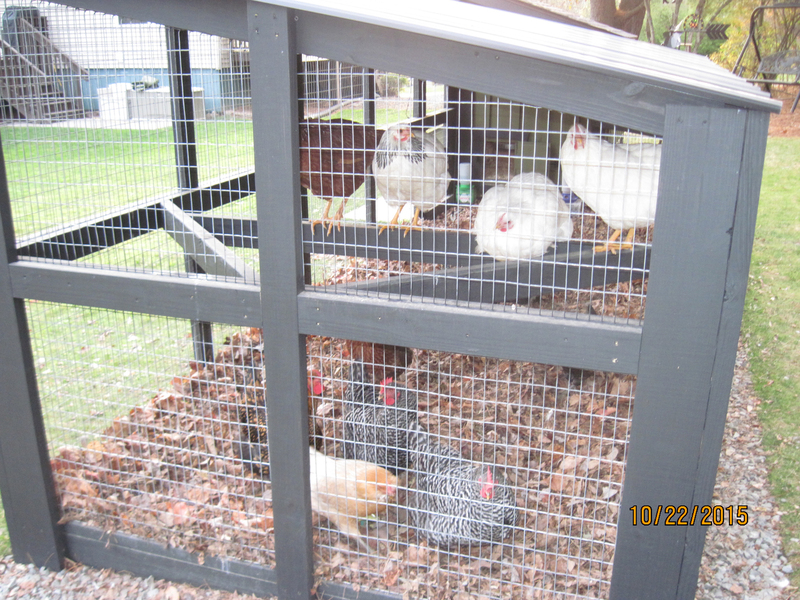 The Crawchicks’ custom chicken run is truly the the Fort Knox of runs! A wonderful coop, combined with their attention to detail in the design of the run, means this flock has plenty to do while staying safe and healthy. Plan for your space. Make sure you have the room to add a structure properly sized for your flock. Not only do you need physical room, but you need legal room. Local building codes may apply. Design your run to meet your flocks needs. Keep in mind what drainage needs you have in your area. Consider how you need to deal with soil contact and your structure. Think about how you will access your run, where you will have feeders, waterers, and toys… and how you want to floor your run. Use quality materials for a run that will last. It may be tempting to cut corners, but if you use good materials and build responsibly, your run will last the rest of your life with minimal maintenance. If you cut corners, you could be dealing with constant issues and losses. Spoil the birds a little. Add a Chicken Swing, Treat Ball, a dust bath, or any number of things to keep your birds happy while you are away. This allows them to express their natural instincts in a way that keeps them satisfied and happy. They will be healthier and happier for the little extra effort. Don’t forget the details! Weather treating your run in some way will not only preserve it for years to come, but it will also add beauty to your yard. Small embellishments such as signs, flower baskets or even a little waterfall can make spending time with your chickens even more relaxing after a busy day. If you’re not quite up to a challenge of designing and building your own custom chicken run, you can always purchase a coop and run. With many designs to search from it’s fun to browse and find one that meets your needs. You can easily add the minor details such as toys and decoration once it arrives. But if you’re a DIY King or Queen, you could create a custom design for yourself like the Crawchicks did! We would love to hear about your runs and how you decorate them in the comments. How many square feet per chicken on the coop/run? Any advise as to any special product to use to treat the wood framing for the run? We were planning on spraying the wood framework with an outdoor stain/sealer. Anything wrong with that? I’d love more information inn this chicken coop. I wouldlike this exact set up. I love this run. Where can i get the plans from top to bottom. I really want the information on what to put on the floor of the run and the coop floor. I have 4 chickens that are almost ready for the coop. 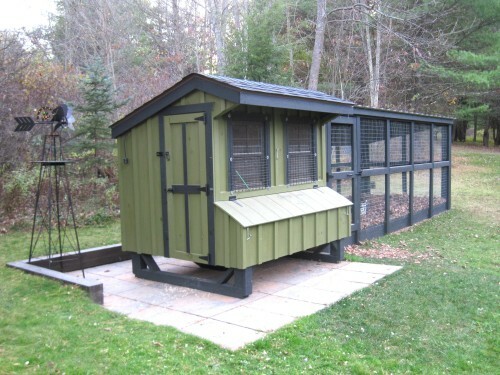 I bought a coop at TSC, but i am going to have to build a run. So i need help. What a palace of a chicken coop/run! Is the wire tacked on the outside or inside of the run, and how is the wire tack on the bottom of the pen. It’s usually better to have the wire tacked on the inside of the run, so a predator like a raccoon can’t get fingers underneath and pry the edges up. As for what to connect the wire with, it depends on how heavy your wire is, and how heavy your frame. Fence staples are very sturdy, but they take a bit of work. Folks sometimes just use heavy duty staples in a staple hammer or pneumatic staple gun. I would hesitate to use a regular staple gun, because without sufficient power, they won’t attach the wire securely. One of the best setups I have seen. Extremely well constructed. This is a project I would love to dare a DIY attempt. Any chance to get the plans or details on this project?? Thank you for the great pics and information! !